On Monday, May 21, 2018, in Ballroom C at the Music City Center in Nashville, Tennessee, one of the greatest financial planning presentations of all time occurred. I am just kidding, I probably passed out on stage and forgot to stop this post from going live. I am typing this post two weeks before the event, so truthfully, I could have passed out on stage and became a YouTube clip or a meme by now. 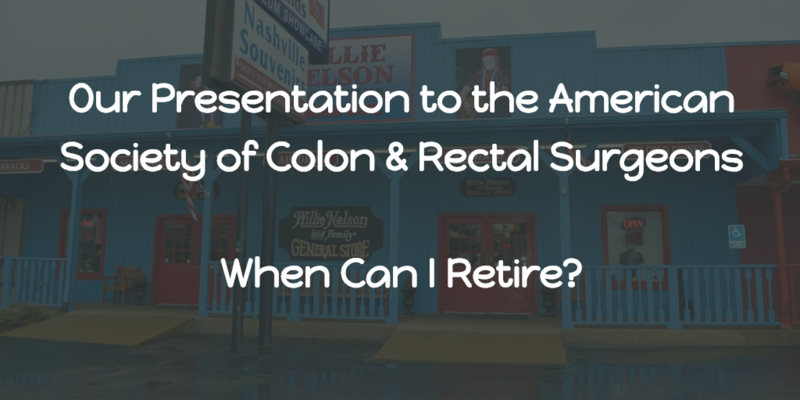 However, the good news is if I did pass out I would have been in a room full of physicians at the American Society of Colon and Rectal Surgeons (ASCRS) conference (Yours truly on page 83)! Jason provided me with the topic, “When Can I Retire?” And while that is one of my favorite questions to answer for our current clients, it is a difficult question to answer when speaking to groups. As you can imagine there are many moving parts to a financial plan, and while the question “When Can I Retire?” has only four words, it can easily require 20+ hours to craft a comprehensive financial plan to answer that “simple” question. With a 20-minute speaking window, I wanted to create a presentation that was easy to understand, but also providing the audience with information that they could put to use when they left Ballroom C.
So, I reworded my presentation to “How Much Do I Need to Retire?” I then created an excel spreadsheet (available below) to use a multiple of expenses to estimate the needed nest egg to retire. The spreadsheet is very simple, it doesn’t have any fancy bells & whistles, but it should provide a good estimate of how much you should have saved by using a multiple of your expenses. I like to phrase it this way, “If I show up at your front door on January 1 of every year with a briefcase full of cash, how much do you need in that briefcase to live for the year?” If you said “$100,000,” and I said a 30x multiple is a good number, you would then need $3,000,000 in your nest egg to retire. Now, we have to include some assumptions to get that number and let's look at the case study below to review those details (also in my slides). No other forms of income (no pensions and no social security), I assume you are only living off your portfolios. In reality, this should be your worst-case scenario. I assume a 6% growth rate and 3% inflation rate which gives us a 3% real rate of return. In the excel spreadsheet, you can adjust those assumptions. I include the annual savings amount to get you to your required nest egg, and I am using a 30x spending multiple for your baseline figure. I included a 40-year, 30-year, and 20-year timeframe for your required annual savings. We did not factor in taxes. Why? Well, it would really over complicate a 20-minute presentation. Are you using pre-tax dollars, Roth dollars, or money from your taxable account? It is probably a combination of those buckets which effects tax rates. Taxes are complicated and ever-changing. What I tell you today will probably be completely inaccurate in a few years (or even by the end of the year!). In the case study, if you needed $100,000 per year to live from in retirement, you will need to have a nest egg of $3,000,000. That is a 30x multiple of your desired spending (30 x $100,000) and based on the assumptions we used, that should last 78-years. The biggest issue here is that it doesn’t factor in the sequence of returns during the decumulation phase, but it should still be a fair estimate. If you were to retire at 60-years-old, 78 years should provide plenty of buffer room. Unless you think you can live past age 138, if so, save more or spend less! For the next part of the presentation, we provide some guidance on where to save. We broke it down into Accumulate 1.0 and Accumulate 2.0. With Accumulate 1.0, we want you to max out your employer plan (401k,403b, etc) and also an IRA or Roth IRA each year. Since we were speaking to a room full of surgeons, we noted the backdoor Roth IRA. With Accumulate 2.0, we advised that simply maxing out your employer plan and a backdoor Roth IRA each year are not going to do the trick. You have to save more than that each year. So we listed a few other options that should be researched. Do you have the option to utilize an after-tax 401k? If your plan has this option, it gives you a possibility to save up to $56,000 (2019) into your qualified plan. FYI, that $56,000 includes all your contributions and your employer contributions. The biggest benefit is tax-deferred growth! It may be possible for a large rollover to a Roth IRA at the separation of service. Here is the article we wrote for The White Coat Investor on this topic: The “Secret” Ultimate Roth Contribution. Does your employer offer more than one retirement plan? For those of you in the non-profit and education systems of medicine, it is not uncommon to have a 403b and a 457b that you can utilize. In addition, you may also be making mandatory contributions to a 401a. Don’t assume one plan, ask HR! Are you saving to a taxable account? If you a married, your taxable account should be a joint account. Joint accounts are good for both asset protection and estate planning. After 65 Stealth IRA: You get penalty-free distributions after age 65 on anything! Now, you still have to pay income taxes, but that is the same for any assets you pull from your IRA. Qualified health care expenses still avoid taxation. Lastly, if you are age 50+ don’t forget to take advantage of your catch-up contributions! Unique Rule for some 403bs: “15-year rule” If you’ve been working for your current employer for 15 years or more and your average annual contribution was less than $5,000 per year, then you can contribute up to $3,000 extra per year, with a $15,000-lifetime maximum. You don’t need to be 50 years old to qualify for this type of catch-up contribution, but if you are 50 or older, you can make both types of catch-up contributions in the same year. Not very common anymore, and I hope you were saving more than $5k/year, but this is still good to know! Unique Rule for 457(b) plans: Certain state and local governments and other tax-exempt entities offer these retirement plans. 457(b) plans may have a special catch-up provision that allows participants within three years of the plan's normal retirement age to contribute up to twice the annual limit, or $38,000 (2019). If you want to stay up to date with us, sign up for the WealthKeel Newsletter (Enter Email Address Here). We share a weekly post called the “WealthKeel Weekly” which includes 2-3 personal financial articles with a summary from yours truly. We also share our newest blog posts through our newsletter. Usual Disclosures: For a comprehensive review of your personal situation, always consult with a tax or legal advisor. Neither Cetera Advisor Networks LLC nor any of its representatives may give legal or tax advice.